I'll admit that I had no idea a reasonably large national park existed within the boundaries of New York City. Even after a short-lived but legitimate childhood obsession with national park trivia, and after having worked in a national park in Wyoming for a little while, this urban recreational area escaped me. 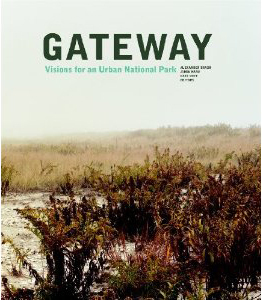 That is until opening Gateway: Visions for an Urban National Park, a book recently released from Princeton Architectural Press. It catalogs the collaborative effort between the National Park Service and a host of designers, mostly landscape architects, in telling the story of this park while continuing to write it. Maybe I missed Gateway, because it has yet to find a clear identity. As Alexander Brash, a director in the National Parks Conservation Association, writes "Gateway really has no clear thematic past, nor has an easily recognizable and unifying vision for its future been embraced." Gateway is split in to three units: Staten Island, the Jamaica Bay section of Brooklyn, and Sandy Hook in New Jersey. There's no clear way to tie them together. Gateway's history is split between a location of early native Lenape trails, the site of NYC's first airport, and America's largest World War II naval base. Less glamorously, it contains a quarantine island that housed sickly immigrants, as well as the final and gruesome destination for most of the city's 19th century transportation system. Gateway is an important estuary for migratory birds, but also a grand experiment in the remediation of over a century worth of unmitigated pollution. Gateway also functions essentially as a regional park for seven million people a year, allowing many to benefit from a national park who may otherwise never visit one. The park's complexity is what makes it such a compelling topic for the design competition. Some of the ideas generated can be more feasibly implemented than others, but, in this case, that's fine. The goal was never to select an out-of-the-box design to be built but rather to generate a host of concepts that could help re-envision the park's future. While the NPS will never actually construct thousands of hydroponic pontoons and push them off into Jamaica Bay, the picture of these floating pods underscores Gateway's need to adapt to the shifting interface between water and land after climate change. This was a major theme that many designers picked up on. Others focused on the park's almost teasing sense of accessibility. While located very near millions of people, it's barely out of reach of the subway and planned ferry services throughout between park sites never materialized. Jamaica Bay became another of Robert Moses' victims when he cut off access from Brooklyn neighborhoods with the Belt Parkway (although, to be fair, Moses also oversaw construction of the popular Jacob Riis park in Gateway). Many proposals tie together ferry lines, subway extensions, multiuse trails, and even overhead cable cars to unify the park and the city. Of all the parks features, by far the greatest attention was paid to the abandoned Floyd Bennett Field, with its crumbling runways and nameless structures scattered around. This is a canvas to good to pass up. An editor of the volume, Kate Orff describes Gateway as "post-picturesque," in contrast to Olmstead's Central Park. "Just as Central Park's construction sharpened our concept of 'the public realm' for an industrializing New York City, re-envisioning Jamaica Bay as a thriving cosmopolitan ecology would further evolve the concept of public space based on stewardship and cultivated wilderness for post-industrial contexts." If the National Park System has traditionally evoked transcendence through spectacular natural beauty or historic narratives, Gateway could be something different. One of the designs had members of the public walking through each stage of a water treatment process. From the point where the effluent flows in, through a series of settling pools, and into a restored marsh. At first, I was skeptical. I doubted that families would really bother to follow the informational signage through this seemingly mundane process. But why not? Where else is this kind of story being told?